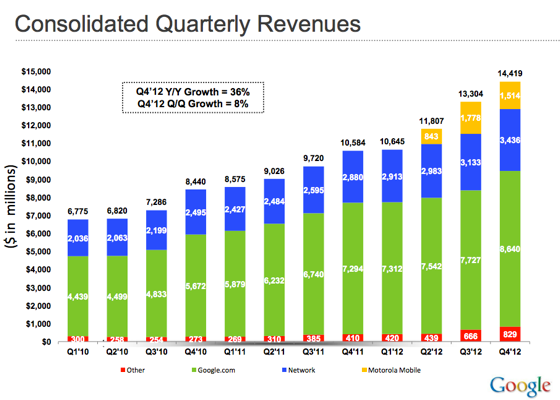 The search giant just announced its Q4 earnings for 2012, and boy did they impress. For the three month period ending December 2012, Google raked in $14.42 billion in revenue and that doesn’t even include the income generated by recently purchased Motorola. Including the income generated by Motorola takes the total to a staggering $15.24 billion. This all translates into a tidy $2.89 billion net profit, up from $2.71 billion the same time last year and $2.74 billion last quarter. $1.3 billion came from my neck of the woods, the UK, but obviously most comes from the US sitting at $5.99 billion. Despite pulling in $1.51 billion in revenue, Motorola lost $353 million while the company is still going through its transition from a failing company to a Google child. Ads seem to make up most of the revenue, accounting for $12 billion from ads alone, and are still the major source of Google’s income. These are some impressive figures that show Google have some serious income at their disposal, but their core profession still remains the center of their profit sheet. It also shows that there is still alot of work left to do with Motorola to turn it back into the profit engine that Google would like.